Les causes primordiales ne nous sont point connues; mais elles sont assujetties à des lois simples et constantes, que l’on peut découvrir par l’observation, et dont l’étude est l’objet de la philosophie naturelle. Primary causes are unknown to us; but are subject to simple and constant laws, which may be discovered by observation, the study of them being the object of natural philosophy. Opening statement from 'Discours Préliminaire' to Théorie Analytique de la Chaleur (1822), i, translated by Alexander Freeman in The Analytical Theory of Heat (1878), 1. All the knowledge we have of nature depends upon facts; for without observations and experiments our natural philosophy would only be a science of terms and an unintelligible jargon. First sentence of 'Preface', Course of Experimental Philosophy (1745), Vol. 1, v.
All the sciences have a relation, greater or less, to human nature; and...however wide any of them may seem to run from it, they still return back by one passage or another. Even Mathematics, Natural Philosophy, and Natural Religion, are in some measure dependent on the science of MAN; since they lie under the cognizance of men, and are judged of by their powers and faculties. A Treatise on Human Nature (1739-40), ed. L. A. Selby-Bigge (1888), introduction, xix. Analysis and natural philosophy owe their most important discoveries to this fruitful means, which is called induction. Newton was indebted to it for his theorem of the binomial and the principle of universal gravity. 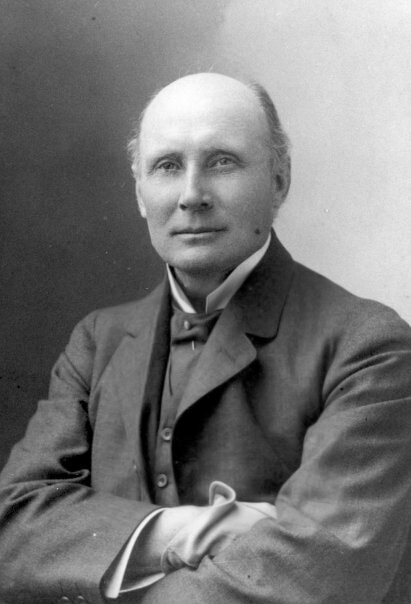 In Frederick Wilson Truscott (trans.) and Frederick Lincoln Emory (trans. ), A Philosophical Essay on Probabilities (1902), 176. And for rejecting such a Medium, we have the Authority of those the oldest and most celebrated Philosophers of Greece and Phoenicia, who made a Vacuum, and Atoms, and the Gravity of Atoms, the first Principles of their Philosophy; tacitly attributing Gravity to some other Cause than dense Matter. Later Philosophers banish the Consideration of such a Cause out of natural Philosophy, feigning Hypotheses for explaining all things mechanically, and referring other Causes to Metaphysicks: Whereas the main Business of natural Philosophy is to argue from Phaenomena without feigning Hypotheses, and to deduce Causes from Effects, till we come to the very first Cause, which certainly is not mechanical; and not only to unfold the Mechanism of the World, but chiefly to resolve these and such like Questions. 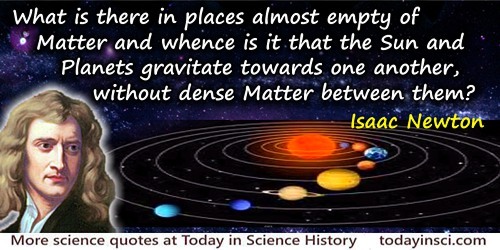 What is there in places almost empty of Matter, and whence is it that the Sun and Planets gravitate towards one another, without dense Matter between them? Whence is it that Nature doth nothing in vain; and whence arises all that Order and Beauty which we see in the World? ... does it not appear from phaenomena that there is a Being incorporeal, living, intelligent, omnipresent, who in infinite space, as it were in his Sensory, sees the things themselves intimately, and thoroughly perceives them, and comprehends them wholly by their immediate presence to himself. In Opticks, (1704, 2nd. Ed. 1718), Book 3, Query 28, 343-5. Newton’s reference to “Nature does nothing in vain” recalls the axiom from Aristotle, which may be seen as “Natura nihil agit frustra” in the Aristotle Quotes on this web site. And having thus passed the principles of arithmetic, geometry, astronomy, and geography, with a general compact of physics, they may descend in mathematics to the instrumental science of trigonometry, and from thence to fortification, architecture, engineering, or navigation. And in natural philosophy they may proceed leisurely from the history of meteors, minerals, plants, and living creatures, as far as anatomy. Then also in course might be read to them out of some not tedious writer the institution of physic. … To set forward all these proceedings in nature and mathematics, what hinders but that they may procure, as oft as shall be needful, the helpful experiences of hunters, fowlers, fishermen, shepherds, gardeners, apothecaries; and in other sciences, architects, engineers, mariners, anatomists. In John Milton and Robert Fletcher (ed. ), 'On Education', The Prose Works of John Milton: With an Introductory Review (1834), 100. As in Mathematicks, so in Natural Philosophy, the Investigation of difficult Things by the Method of Analysis, ought ever to precede the Method of Composition. This Analysis consists in making Experiments and Observations, and in drawing general Conclusions from them by Induction, and admitting of no Objections against the Conclusions, but such as are taken from Experiments, or other certain Truths. For Hypotheses are not to be regarded in experimental Philosophy. From Opticks, (1704, 2nd ed. 1718), Book 3, Query 31, 380. For even they who compose treatises of medicine or natural philosophy in verse are denominated Poets: yet Homer and Empedocles have nothing in common except their metre; the former, therefore, justly merits the name of the Poet; while the other should rather be called a Physiologist than a Poet. For the harmony of the world is made manifest in Form and Number, and the heart and soul and all the poetry of Natural Philosophy are embodied in the concept of mathematical beauty. On Growth and Form (1917), Epilogue, 778-9. Geology is intimately related to almost all the physical sciences, as is history to the moral. An historian should, if possible, be at once profoundly acquainted with ethics, politics, jurisprudence, the military art, theology; in a word, with all branches of knowledge, whereby any insight into human affairs, or into the moral and intellectual nature of man, can be obtained. It would be no less desirable that a geologist should be well versed in chemistry, natural philosophy, mineralogy, zoology, comparative anatomy, botany; in short, in every science relating to organic and inorganic nature. With these accomplishments the historian and geologist would rarely fail to draw correct and philosophical conclusions from the various monuments transmitted to them of former occurrences. Principles of Geology (1830-3), Vol. 1, 2-3. Geology, perhaps more than any other department of natural philosophy, is a science of contemplation. It requires no experience or complicated apparatus, no minute processes upon the unknown processes of matter. It demands only an enquiring mind and senses alive to the facts almost everywhere presented in nature. And as it may be acquired without much difficulty, so it may be improved without much painful exertion. 'Lectures on Geology, 1805 Lecture', in R. Siegfried and R. H. Dott (eds. ), Humphry Davy on Geology (1980), 13. 'L. Of Studies,' Essays (1597). In Francis Bacon and Basil Montagu, The Works of Francis Bacon, Lord Chancellor of England (1852), 55. I can assure you, reader, that in a very few hours, even during the first day, you will learn more natural philosophy about things contained in this book, than you could learn in fifty years by reading the theories and opinions of the ancient philosophers. Enemies of science will scoff at the astrologers: saying, where is the ladder on which they have climbed to heaven, to know the foundation of the stars? But in this respect I am exempt from such scoffing; for in proving my written reason, I satisfy sight, hearing, and touch: for this reason, defamers will have no power over me: as you will see when you come to see me in my little Academy. The Admirable Discourses (1580), trans. Aurele La Rocque (1957), 27. I do not think the division of the subject into two parts - into applied mathematics and experimental physics a good one, for natural philosophy without experiment is merely mathematical exercise, while experiment without mathematics will neither sufficiently discipline the mind or sufficiently extend our knowledge in a subject like physics. to Henry Roscoe, Professor of Chemistry at Owens College (2 Jun 1870), B.C.S Archive Quoted in R.H. Kargon, Science in Victorian Manchester (1977), 215. I have always looked upon alchemy in natural philosophy to be like enthusiasm in divinity, and to have troubled the world much to the same. In The Works of Sir William Temple, Bart (1814), 506. I purpose, in return for the honour you do us by coming to see what are our proceedings here, to bring before you, in the course of these lectures, the Chemical History of a Candle. I have taken this subject on a former occasion; and were it left to my own will, I should prefer to repeat it almost every year—so abundant is the interest that attaches itself to the subject, so wonderful are the varieties of outlet which it offers into the various departments of philosophy. There is not a law under which any part of this universe is governed which does not come into play, and is touched upon in these phenomena. There is no better, there is no more open door by which you can enter the study of natural philosophy, than by considering the physical phenomena of a candle. A Course of Six Lectures on the Chemical History of a Candle (1861), 13-4. I will simply express my strong belief, that that point of self-education which consists in teaching the mind to resist its desires and inclinations, until they are proved to be right, is the most important of all, not only in things of natural philosophy, but in every department of dally life. 'Observations On Mental Education', a lecture before the Prince Consort and the Royal Institution, 6 May 1854. Experimental researches in chemistry and physics (1859), 477. If any person thinks the examination of the rest of the animal kingdom an unworthy task, he must hold in like disesteem the study of man. For no one can look at the primordia of the human frame—blood, flesh, bones, vessels, and the like—without much repugnance. Moreover, in every inquiry, the examination of material elements and instruments is not to be regarded as final, but as ancillary to the conception of the total form. Thus, the true object of architecture is not bricks, mortar or timber, but the house; and so the principal object of natural philosophy is not the material elements, but their composition, and the totality of the form to which they are subservient, and independently of which they have no existence. On Parts of Animals, Book 1, Chap 5, 645a, 26-36. In W. Ogle (trans. ), Aristotle on the Parts of Animals (1882), 17. Alternate translations: “primodia” = “elements”; “Moreover ... Thus” = “Moreover, when anyone of the parts or structures, be it which it may, is under discussion, it must not be supposed that it is its material composition to which attention is being directed or which is the object of the discussion, but rather the total form. Similarly”; “form ... subservient, and” = “totality of the substance.” See alternate translation in Jonathan Barnes (ed. ), The Complete Works of Aristotle (1984), Vol. 1, 1004. In mathematics, … and in natural philosophy since mathematics was applied to it, we see the noblest instance of the force of the human mind, and of the sublime heights to which it may rise by cultivation. An acquaintance with such sciences naturally leads us to think well of our faculties, and to indulge sanguine expectations concerning the improvement of other parts of knowledge. To this I may add, that, as mathematical and physical truths are perfectly uninteresting in their consequences, the understanding readily yields its assent to the evidence which is presented to it; and in this way may be expected to acquire the habit of trusting to its own conclusions, which will contribute to fortify it against the weaknesses of scepticism, in the more interesting inquiries after moral truth in which it may afterwards engage. In Elements of the Philosophy of the Human Mind (1827), Vol. 3, Chap. 1, Sec. 3, 182. In order to discover Truth in this manner by observation and reason, it is requisite we should fix on some principles whose certainty and effects are demonstrable to our senses, which may serve to explain the phenomena of natural bodies and account for the accidents that arise in them; such only are those which are purely material in the human body with mechanical and physical experiments … a physician may and ought to furnish himself with, and reason from, such things as are demonstrated to be true in anatomy, chemistry, and mechanics, with natural and experimental philosophy, provided he confines his reasoning within the bounds of truth and simple experiment. As quoted in selection from the writings of Herman Boerhaave, collected in Oliver Joseph Thatcher (ed. ), The Ideas that Have Influenced Civilization, in the Original Documents (1800), Vol. 6, 242. It is a great pity Aristotle had not understood mathematics as well as Mr. Newton, and made use of it in his natural philosophy with good success: his example had then authorized the accommodating of it to material things. In Second Reply to the Bishop of Worcester. It is customary to connect Medicine with Botany, yet scientific treatment demands that we should consider each separately. For the fact is that in every art, theory must be disconnected and separated from practice, and the two must be dealt with singly and individually in their proper order before they are united. And for that reason, in order that Botany, which is, as it were, a special branch of Natural Philosophy [Physica], may form a unit by itself before it can be brought into connection with other sciences, it must be divided and unyoked from Medicine. Methodi herbariae libri tres (1592), translated in Agnes Arber, Herbals: Their Origin and Evolution, 2nd edition (1938), 144. Mathematic is either Pure or Mixed: To Pure Mathematic belong those sciences which handle Quantity entirely severed from matter and from axioms of natural philosophy. These are two, Geometry and Arithmetic; the one handling quantity continued, the other dissevered. … Mixed Mathematic has for its subject some axioms and parts of natural philosophy, and considers quantity in so far as it assists to explain, demonstrate and actuate these. In De Augmentis, Bk. 3; Advancement of Learning, Bk. 2. Mathematics in gross, it is plain, are a grievance in natural philosophy, and with reason…Mathematical proofs are out of the reach of topical arguments, and are not to be attacked by the equivocal use of words or declamation, that make so great a part of other discourses; nay, even of controversies. Mathematics, including not merely Arithmetic, Algebra, Geometry, and the higher Calculus, but also the applied Mathematics of Natural Philosophy, has a marked and peculiar method or character; it is by preeminence deductive or demonstrative, and exhibits in a nearly perfect form all the machinery belonging to this mode of obtaining truth. Laying down a very small number of first principles, either self-evident or requiring very little effort to prove them, it evolves a vast number of deductive truths and applications, by a procedure in the highest degree mathematical and systematic. In Education as a Science (1879), 148. Mr. Dalton's aspect and manner were repulsive. There was no gracefulness belonging to him. His voice was harsh and brawling; his gait stiff and awkward; his style of writing and conversation dry and almost crabbed. In person he was tall, bony, and slender. He never could learn to swim: on investigating this circumstance he found that his spec. grav. as a mass was greater than that of water; and he mentioned this in his lectures on natural philosophy in illustration of the capability of different persons for attaining the art of swimming. Independence and simplicity of manner and originality were his best qualities. Though in comparatively humble circumstances he maintained the dignity of the philosophical character. As the first distinct promulgator of the doctrine that the elements of bodies unite in definite proportions to form chemical compounds, he has acquired an undying fame. Dr John Davy's (brother of Humphry Davy) impressions of Dalton written in c.1830-31 in Malta. Quoted in W. C. Henry, Memoirs of the Life and Scientific Researches of John Dalton (1854), 217-8. Natural Magick is taken to be nothing else, but the chief power of all the natural Sciences; which therefore they call the top and perfection of Natural Philosophy, and which is indeed the active part of the same; which by the assistance of natural forces and faculties, through their mutual & opportune application, performs those things that are above Humane Reason. In The Vanity of the Arts and Sciences (1530), translation (1676), 110. Not only such Actions as were at first Indifferent to us, but even such as were Painful, will by Custom and Practice become Pleasant. Sir Francis Bacon observes in his Natural Philosophy, that our Taste is never pleased better, than with those things which at first created a Disgust in it. He gives particular Instances of Claret, Coffee, and other Liquors, which the Palate seldom approves upon the first Taste; but when it has once got a Relish of them, generally retains it for Life. In The Spectator (2 Aug 1712), No. 447, collected in The Spectator (9th ed., 1728), Vol. 6, 225-226. Oersted would never have made his great discovery of the action of galvanic currents on magnets had he stopped in his researches to consider in what manner they could possibly be turned to practical account; and so we would not now be able to boast of the wonders done by the electric telegraphs. Indeed, no great law in Natural Philosophy has ever been discovered for its practical implications, but the instances are innumerable of investigations apparently quite useless in this narrow sense of the word which have led to the most valuable results. From Silvanus Phillips Thompson, 'Introductory Lecture to the Course on Natural Philosophy', The Life of Lord Kelvin (1910), Vol. 1, Appendix to Chap. 5, 249. Painting is a science, and should be pursued as an inquiry into the laws of nature. Why, then, may not landscape painting be considered as a branch of natural philosophy, of which pictures are but the experiments? 'The History of Landscape Painting', quoted in Charles Tomlinson, Collected Poems (1985), 33. Proposals for forming a Public Institution for diffusing the knowledge of Mechanical Inventions, and for teaching, by Philosophical Lectures and Experiments, the application of Science to the common purposes of life. Title of the pamphlet (Apr 1799) in which he proposed what is now the Royal Institution. As named in a notice under 'A Correct List of New Publications', The Monthly Magazine: Part 1 for 1799 from January to June, inclusive (Apr 1799), 7, Part 1, 221. Science itself is badly in need of integration and unification. The tendency is more and more the other way ... Only the graduate student, poor beast of burden that he is, can be expected to know a little of each. As the number of physicists increases, each specialty becomes more self-sustaining and self-contained. Such Balkanization carries physics, and indeed, every science further away, from natural philosophy, which, intellectually, is the meaning and goal of science. Science, The Center of Culture (1970), 92. Quoted by Victor F. Weisskopf, 'One Hundred Years of the Physical Review', in H. Henry Stroke, Physical Review: The First Hundred Years: a Selection of Seminal Papers and Commentaries, Vol. 1, 15. Scientific wealth tends to accumulate according to the law of compound interest. Every addition to knowledge of the properties of matter supplies the physical scientist with new instrumental means for discovering and interpreting phenomena of nature, which in their turn afford foundations of fresh generalisations, bringing gains of permanent value into the great storehouse of natural philosophy. From Inaugural Address of the President to British Association for the Advancement of Science, Edinburgh (2 Aug 1871). Printed in The Chemical News (4 Aug 1871), 24, No. 610., 53. 'Of Studies' (1625) in James Spedding, Robert Ellis and Douglas Heath (eds. ), The Works of Francis Bacon (1887-1901), Vol. 6, 498. Tait dubbed Maxwell dp/dt, for according to thermodynamics dp/dt = JCM (where C denotes Carnot’s function) the initials of (J.C.) Maxwell’s name. On the other hand Maxwell denoted Thomson by T and Tait by T'; so that it became customary to quote Thomson and Tait’s Treatise on Natural Philosophy as T and T'. The aim of science is to seek the simplest explanations of complex facts. 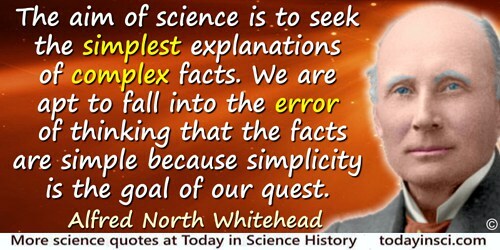 We are apt to fall into the error of thinking that the facts are simple because simplicity is the goal of our quest. The guiding motto in the life of every natural philosopher should be, Seek simplicity and distrust it. In The Concept of Nature: Tarner Lectures Delivered in Trinity College, November 1919 (1920), 163. 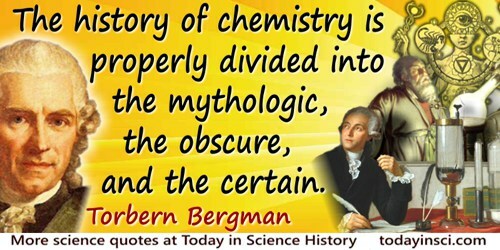 The history of chemistry is properly divided into the mythologic, the obscure, and the certain. The first period exhibits it from its infancy, deformed by fictions, until the destruction of the library of Alexandria by the Arabs. —The second, though freed in some measure from these absurdities, yet is still clothed in numberless enigmas and allegorical expressions.— The third period commences at the middle of the seventeenth century, with the first establishment of societies and academies of science; of which the wise associates, in many places uniting their efforts, determined to pursue the study of Natural Philosophy by observation and experiments, and candidly to publish their attempts in a general account of their transactions. In Essays, Physical and Chemical (1791), 4, translated from the original Latin. The main Business of Natural Philosophy is to argue from Phænomena without feigning Hypotheses, and to deduce Causes from Effects till we come to the very first Cause, which certainly is not mechanical; and not only to unfold the Mechanism of the World, but chiefly to resolve these, and to such like Questions. From 'Query 31', Opticks (1704, 2nd ed., 1718), 344. The mere man of pleasure is miserable in old age, and the mere drudge in business is but little better, whereas, natural philosophy, mathematical and mechanical science, are a continual source of tranquil pleasure, and in spite of the gloomy dogmas of priests and of superstition, the study of these things is the true theology; it teaches man to know and admire the Creator, for the principles of science are in the creation, and are unchangeable and of divine origin. Age of Reason (1794, 1818), 35. The opinion of Bacon on this subject [geometry] was diametrically opposed to that of the ancient philosophers. He valued geometry chiefly, if not solely, on account of those uses, which to Plato appeared so base. And it is remarkable that the longer Bacon lived the stronger this feeling became. When in 1605 he wrote the two books on the Advancement of Learning, he dwelt on the advantages which mankind derived from mixed mathematics; but he at the same time admitted that the beneficial effect produced by mathematical study on the intellect, though a collateral advantage, was “no less worthy than that which was principal and intended.” But it is evident that his views underwent a change. When near twenty years later, he published the De Augmentis, which is the Treatise on the Advancement of Learning, greatly expanded and carefully corrected, he made important alterations in the part which related to mathematics. He condemned with severity the pretensions of the mathematicians, “delidas et faslum mathematicorum.” Assuming the well-being of the human race to be the end of knowledge, he pronounced that mathematical science could claim no higher rank than that of an appendage or an auxiliary to other sciences. Mathematical science, he says, is the handmaid of natural philosophy; she ought to demean herself as such; and he declares that he cannot conceive by what ill chance it has happened that she presumes to claim precedence over her mistress. In 'Lord Bacon', Edinburgh Review (Jul 1837). Collected in Critical and Miscellaneous Essays: Contributed to the Edinburgh Review (1857), Vol. 1, 395. The sciences are taught in following order: morality, arithmetic, accounts, agriculture, geometry, longimetry, astronomy, geomancy, economics, the art of government, physic, logic, natural philosophy, abstract mathematics, divinity, and history. From Ain-i-Akbery (c.1590). As translated from the original Persian, by Francis Gladwin in 'Akbar’s Conduct and Administrative Rules', 'Regulations For Teaching in the Public Schools', Ayeen Akbery: Or, The Institutes of the Emperor Akber (1783), Vol. 1, 290. Note: Akbar (Akber) was a great ruler; he was an enlightened statesman. He instituted a great system for general education. To what purpose should People become fond of the Mathematicks and Natural Philosophy? … People very readily call Useless what they do not understand. It is a sort of Revenge… One would think at first that if the Mathematicks were to be confin’d to what is useful in them, they ought only to be improv'd in those things which have an immediate and sensible Affinity with Arts, and the rest ought to be neglected as a Vain Theory. But this would be a very wrong Notion. As for Instance, the Art of Navigation hath a necessary Connection with Astronomy, and Astronomy can never be too much improv'd for the Benefit of Navigation. Astronomy cannot be without Optics by reason of Perspective Glasses: and both, as all parts of the Mathematicks are grounded upon Geometry … . We come therefore now to that knowledge whereunto the ancient oracle directeth us, which is the knowledge of ourselves; which deserveth the more accurate handling, by how much it toucheth us more nearly. This knowledge, as it is the end and term of natural philosophy in the intention of man, so notwithstanding it is but a portion of natural philosophy in the continent of nature. And generally let this be a rule, that all partitions of knowledges be accepted rather for lines and veins, than for sections and separations; and that the continuance and entireness of knowledge be preserved. For the contrary hereof hath made particular sciences to become barren, shallow, and erroneous; while they have not been nourished and maintained from the common fountain. So we see Cicero the orator complained of Socrates and his school, that he was the first that separated philosophy and rhetoric; whereupon rhetoric became an empty and verbal art. So we may see that the opinion of Copernicus touching the rotation of the earth, which astronomy itself cannot correct because it is not repugnant to any of the phenomena, yet natural philosophy may correct. So we see also that the science of medicine, if it be destituted and forsaken by natural philosophy, it is not much better than an empirical practice. With this reservation therefore we proceed to Human Philosophy or Humanity, which hath two parts: the one considereth man segregate, or distributively; the other congregate, or in society. So as Human Philosophy is either Simple and Particular, or Conjugate and Civil. Humanity Particular consisteth of the same parts whereof man consisteth; that is, of knowledges that respect the Body, and of knowledges that respect the Mind. But before we distribute so far, it is good to constitute. For I do take the consideration in general and at large of Human Nature to be fit to be emancipate and made a knowledge by itself; not so much in regard of those delightful and elegant discourses which have been made of the dignity of man, of his miseries, of his state and life, and the like adjuncts of his common and undivided nature; but chiefly in regard of the knowledge concerning the sympathies and concordances between the mind and body, which, being mixed, cannot be properly assigned to the sciences of either. The Advancement of Learning (1605) in James Spedding, Robert Ellis and Douglas Heath (eds. ), The Works of Francis Bacon (1887-1901), Vol. 3, 366-7. (1986) Quoted in Anthony L. Peratt, 'Dean of the Plasma Dissidents', Washington Times, supplement: The World and I (May 1988),192. Dialogue on the Great World Systems (1632). Revised and Annotated by Giorgio De Santillana (1953), 66.